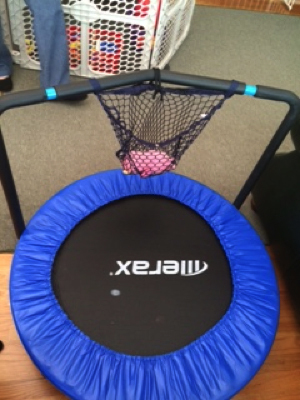 One simple way to make trampoline time a fun and safe experience! Frequently, children like to carry stuffed animals or toys on the trampoline with them. Here is an easy way to keep them safe without giving up their toys. You can simply attach a small net organizer to the trampoline safety bar. This family used the net from an umbrella stroller. You could also use any removable stroller organizer. This allows the child to keep the toy near them and hold onto the safety bar. This entry was posted in General info, Tips from therapists and tagged adapted trampoline, Easter Seals, trampoline safety on September 17, 2015 by Easterseals.